As a full-time music icon, part-time actress and all-time MTV mainstay, Susanna Hoffs has effortlessly captivated audiences for almost three decades now. While she could certainly keep an eye on the rearview mirror and enjoy her past successes, her continued creative output shows that she’s determined to keep things moving forward with the pedal to the floor. As if having a new solo album (Someday releases on July 17) on the horizon weren’t enough, Susanna has also crafted a unique 5-song EP just for NoiseTrade. Some Summer Days features exclusive acoustic versions of three songs from Someday, as well as two brand new songs that are not featured on the new album. With her indelible voice, uncanny ear for melody and 60s-soaked musical vibe, Susanna once again delivers a perfect pop record that is layered with genuine emotion, smart hooks and talented musicianship. You don’t have to dig very deep in Susanna’s back catalog to find her unabashed love for music from the 60s and 70s. Not only is The Bangles discography full of amazing covers like The Merry-Go Round’s “Live,” The Grass Roots’ “Where Were You When I Needed You,” Big Star’s “September Gurls” and Simon and Garfunkel’s “Hazy Shade of Winter,” but she has also put out two entire volumes of decade specific covers with Matthew Sweet entitled Under the Covers. The five original songs on Some Summer Days continues in this same musical vein of relaxed grooves, jangly guitars and part pop, part folk, part rock songwriting. 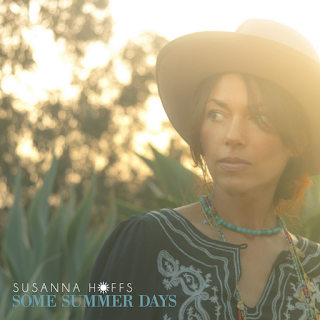 The three fantastic acoustic tracks on Some Summer Days really showcase Susanna’s crystal clear voice and her amazing songwriting craftsmanship. “Raining” gently pulses along on a slinky guitar riff, Beatlesly bass line and light percussive gallop. “One Day” brings to mind a mix of the excitement of early Tom Petty and the Heartbreakers material and the harmonies of The Mamas and the Papas. “Always Enough” has a soulful ebb and flow to it and the emotion in the vocals are beautifully matched by the instrumental tones. The two non-album tracks are pretty cool in their own right and bookend the EP very nicely. “Petite Chanson” (French for “small song”) is aptly named as it clocks in at just a little over two minutes, but Susanna packs quite a melodic punch in a short amount of time. I guarantee you’ll be humming the background vocals for most of the next day or two after hearing it. “Summer Daze” closes out the EP nicely with more great singalong harmonies and strumalong chords. While you’ll find that Some Summer Days is a perfect soundtrack for your lazy beachfront days or cozy backporch nights, you’ll also discover that its not too shabby for the moments in between as well. I've been a fan of Susanna Hoffs for years, love her work with The Bangles, her work with Matthew Sweet and especially her solo material. Her voice is amazing.